We start technical audits the day after a new client signs a contact. Why? The remainder of this post will explain how to perform every step of the audit. NOTE: The audit’s goal is identify errors, not fix them. The best practice is to work with the client’s developer to get the fixes implemented. This does not include keyword research, competitive analysis and link profile analysis. Our audits focus solely on the technical performance and on site factors. Enter your email below and we'll send you the link. Like this form? Create one for your site, free. Findability refers to how easily website information can be found by both search engines and website visitors. This section will cover how accessible your website’s content is to external bots and internal users. How many pages on your website are indexed by search engines. We’re moving to an search algorithm that favors content rich websites. If you operate in a competitive space (i.e. legal) you standard 5 page website just won’t cut it anymore. If you have a lot of content on your website, this will tell you if Google is aware of it. A low indexation rate could point to a number of issues (lack of internal linking, render blocking code on your pages, low domain authority and more). 1. By going to Google and typing in site:yoursite.com and seeing how many pages show up in Google’s index. 2. By checking your Google Search Console to see how many pages are indexed. The ability for your hosting and web server to keep your website online and reduce downtime. Why does website uptime matter? Website speed and stability are crucial for search engines to index your website regularly and properly. If your website experiences significant downtime, you could experience ranking decreases and push users away from visiting. How can I check my site’s uptime? 1. You can run a free check using Pingdom. 2. If you’re experiencing ongoing issues, Pingdom offers a quality service (paid) option to monitor your website in real time. 3. For large website, monitoring is a must. If you experience issues with website uptime, upgrade your hosting to a private server or dedicated package. This file instructs search engines on how to access your website. You can control how bots can or can’t access your website. How can I check my site’s Robots.txt file? This HTML tag is placed in between the <head> code on a page and gives search engines instructions on how to interpret that page specific content (NOT site wide). For example, <meta name=”robots” content=”noindex”> lets search engines know not to index that page. You can also use this tag to index or noindex images, pages and follow / nofollow links on a page. NOTE: Don’t confuse this NOFOLLOW with the rel=”nofollow” link attribute. A “nofollow” in the <head> section will no follow all links on that page, while the rel=”nofollow” is link specific. Sloppy web development could have accidentally placed “noindex” directives on important, which would cause your site to have a low index rate. If you have similar or duplicate content on your website, you can place “noindex” tags on 1 of those pages to avoid duplicate content penalty. You might want to “nofollow” external links on certain pages. Search engines crawl from site to site through links, you don’t want spiders exiting powerful pages to other websites. Dump your URL into Screaming Frog SEO Spider. Under the “Internal” tab, scroll to the right. You will see “Meta Robots 1” and “Meta Robots 2”. These two columns will tell you the directives of each page on your website. 40x are “Bad Request” errors take place when the request sent to the web server, fails. There are a number of client side errors that can occur (401, 403) but the most common is a 404 error, which generally happens when traffic is directed to a page that no longer exists. Full list of 40x errors. Why do 40x errors matter? General rule of thumb, anytime your website isn’t rendering properly for visitors, this is a bad thing. 404 errors in particular go against SEO best practices. When deleting or moving pages, we want to make sure the proper steps have been taken to ensure a proper user experience (UX) and minimal loss of inbound link equity. 404 pages with inbound links or significant inbound traffic should be 301 (permanently redirected) to a similar piece of content on your site. How can I check my site’s 40x errors? Navigate to Crawl > Crawl Errors. You will see a list of 4ox errors occurring on your site. Are these pages you meant to delete? Do they have inbound links pointing to them? Traffic? Consider setting up 301 redirects to manage them. When failure to render a page falls on the server. Why do 50x errors matter? A large spike in these errors could point to an inability for your web hosting and server to manage the requirements of your website, resulting in downtime for visitors. How can I check my site’s 50x errors? Navigate to Crawl > Crawl Errors > Other. You will see a list of 5ox errors occurring on your site (if applicable). A sitemap that lives on a web page, not an XML file. Why do HTML sitemaps matter? HTML sitemaps provide an easily navigable view for website users. In addition, they provide a page that can evenly distribute equity to deep and less crawled pages on your website. Matt Cutts on HTML Sitemaps. Do you have a page on your website that links to every page on your site? Use this tool to generate an HTML sitemap. An XML file that helps search engines better crawl and understand your website. Why do XML sitemaps matter? They help improve indexation of your website. You’re able to set a “crawl budget”, i.e. the importance of each page / page type on your website. This is especially important for massive (10K+ pages) websites that want to give preference to set of pages for search engine crawl time. It helps protect your website against duplicate content. Getting a page indexed and list in your sitemap will give you ownership over it. How can I check if my site has an XML sitemap? Visit yoursite.com/sitemap.xml – do you have one listed? Here you can view your sitemap or submit one. For WordPress sites, there are dozens of plugins to help you create one. For non WordPress sites, use this tool. If you create video content, a video sitemap will help you rank in Google Videos section. This is a great way to easily boost organic traffic. Visit yoursite.com/sitemap_video.xml – do you have one listed? Use this tool to generate a video sitemap. Submit your video sitemap in Google Search Console, (Crawl > Sitemaps > Add/Test Sitemap). What is an image XML sitemap? An image sitemap helps search engines to quickly identify image content and index it in image searches. Why do image XML sitemaps matter? People actively bypass organic results for image results, depending on the query. How can I check if my site has an image XML sitemap? Use this tool to generate an image sitemap. HTML commands (“rel = prev” and “rel = next”) on content that spills over into multiple pages, but should be treated as one. For example, your blog (yoursite.com/blog) might have multiple pages (yoursite.com/blog/2) as you create more content. Pagination tags should be used on the “Next page” and “Previous page” links to alert search engines of this. This also applies to eCommerce sites with multiple product pages and long guides that is broken down into multiple pages. These tags can help combat duplicate content penalties and low indexation rates. Alerts users and search engines when a page has been removed from your site. Sometimes deleting content (aka 404’ing it) is what’s best for your site, even if people will still be visiting it. If that’s the case, a custom 404 page should alert people where to find other important pages on your website. Use internal links to pass equity to target pages. Hosting content – setting up a blog – blog.yourdomain.com. Testing – a place to test offline content before pushing live to your final domain – staging.yoursite.com. Private content – we use training.webris.org to host internal training content for staff members. blog.yoursite.com should be set to “index” and have it’s own set of directives (robots.txt and sitemap.xml) for proper search engine indexation. staging.yoursite.com should be set to “noindex” to avoid duplicate content penalties and searchers stumbling on content that wasn’t approved to go live yet. You can use this free tool to find and discover your site’s subdomains. The structure of your website is incredibly important for search engines to properly rank it. This section covers the necessary checks to ensure it’s setup properly. A trail, or secondary navigation, clearly visible to website users to help them navigate your website. Search engines crawl from page to page through links. Breadcrumbs enforce page hierarchy and navigation to search engines. Breadcrumbs also help users to navigate content, particularly on eCommerce websites with a number of product categories and high page depth. If you have a content heavy website, users can get lost deep in your site. Breadcrumbs help to easily find their place and continue browsing, without having to use the top level navigation to return. This check is better for eCommerce sites, less important for smaller sites with low pages. If you have breadcrumbs enabled, you should see them appear underneath your navigation as you dive deep into your site. Not every website needs breadcrumbs, but content heavy and eCommerce websites should always have them setup. How to setup breadcrumbs in WordPress. How to code a breadcrumbs menu. The main menu and navigation on a website. TLNs have a tremendous impact on both search indexation and the overall user experience. Users want a logical, easy to use and find menu that clearly directs them where they need to go. Search engines want the same thing – your top pages should be linked to from the TLN, whether that’s a dedicated section or a drop down depends on the amount of content on your website. How can I analyze my site’s TLN? Are your target pages linked to from your TLN? Are you using SEO optimized titles in your TLN? Is your TLN well organized for user’s to find what they need with minimal clicks? Your TLN should be coded in HTML, NOT JS! You can’t link to every page on your website from your TLN (unless you have a small website). Footers provide a great opportunity to pass equity to various pages or sections on your website. It really depends on your website’s goals, niche and depth of pages. Generally speaking, I like to use the footer to link to important, non sales pages. Google’s latest update looks hard at the quality and depth of content on your website to ensure that you’re a legitimate, functioning business. It’s important to get these pages crawled by search engines, the footer is the best place to show search engines that these pages are an important part of your website. This refers to the number of ‘clicks’ your pages are away from the starting URL. Why does site depth / structure matter? Both search engines and users shouldn’t have to click 1,000 times to get to important content on your website. General SEO best practices state to keep important contnet (i.e. pages you want to rank) within 4 click of the starting URL (i.e. your home page). Basically what that means is target pages should be easily accessible from top level nav, footer or located within a few clicks of these pages. All the way to the right, click on “Site Structure”. You will see stats about how many pages you have and their depth from the starting URL. Analyze which pages are over 3 clicks and decide if there’s a better place for them to live within your website. This section is dedicated entirely to analyzing a website’s URLs for proper optimization. The entire analysis will be done using Screaming Frog SEO Spider for analysis. Using _ or , as your URL structure causes search engines to read URL strings wrong. Search engines read – as spaces. Using them ensures your content will be read the right way. How can I check my URLs? Set the tab to “URI”. In the search bar, enter “_”. NOTE: you can also export your crawl to Excel for better filtering and analysis. URLs should be structured (when possible) to be clean, short, memorable and shareable. User experience signals (SERP click through rate in particular) are increasingly important ranking factors. Short, clean and readable URLs drive more SERP clicks than non friendly URLs. Export data to Excel and analyze. It could be a CMS issue forcing URLs into unfriendly states. If URLs are human generated, you should recommend creating a URL structuring guide for those pushing URLs live to ensure friendliness going forward. Consider changing extremely unfriendly for cleaner ones, 301 redirect old into the new. What are absolute and relative URLs? Relative URLs are often used by web developers as shorthand to code internal links on a website. They do not contain the full URL, but still link to the destination page. Absolute URLs contain the full URL string when linking internally to another page. Relative URLs are SLIGHTLY better for page loading times and easier for developers when coding HTML. Absolute URLs are better for SEO as they contain the full URL string, better optimized for search engine crawling. On any given page on the website, right click and select “view source code”. If it’s coded as <a href = “http://yoursite.com/link/” > anchor</a>, it’s an absolute link. This is the biggest section on the audit. It covers how to analyze individual pages in bulk to uncover issues with the site. Signals to Google which language is being used on a page. Why does Meta “hreflang” matter? If you have content in different languages on your website, you want to make sure that the appropriate page is served to the searcher based on what language they’re using. Results will be served based on location. Ex. spanish pages with hreflang=es will be served to IP addresses in Spanish speaking countries. How can I check for Meta “hreflang” on my site? Right click + “View Page Source”. Shows a rich snippet of the author in the SERP. Why does authorship markup matter? Currently Google has suspended authorship markup; however may bring it back in future. How can I check if I have Authorship markup? Verify with Google Structured Data Testing tool. This markup connects the entire website to the publisher. While they can be used mutually exclusive, publisher markup is for companies and authorship markup is for individuals. Similar to how authorship markup shows a picture of the author as a rich snippet, publisher markup shows a summary of the companies google plus page on the right hand side of the screen when someone searches for the company by name. Why does Publisher markup matter? It good for branding as the searcher will get a snapshot of your company’s name, logo, address, pictures and reviews. How can I check if I have Publisher markup? Verify that your website is connected to your business google plus page. Your meta descriptions should be no longer than 156 characters. Anything more will get truncated by Google. Your pages should all have meta tags, none missing. Your pages should all have unique meta tags, no duplicates. They matter because they act as descriptors for your site. They tell the user what content they can expect to find when they click on the result. While they have no direct ranking impact, they increase SERP click through rate, which is a ranking factor. Check your Screaming Frog report. The title of your pages. This should be written both for SEO benefit and to incite a click from the user. It’s best to structure your page title with your main keywords within in. You must keep page title’s to under 65 characters. Anything more will get truncated by Google. Your pages should all have title tags, none missing. Your pages should all have unique title tags, no duplicates. Why do the <title> tags matter? Title tags are HUGE on page ranking factors. It draws the most attention to the user in the SERP with larger text and highlighted blue. Viewing the source code of your page. Using the site:url operator to read your titles in SERPs. Check your Screaming Frog audit. Aka <h1> tags, are generally found at the top of the page and display the page’s heading (may be different from the title tag). There should only be 1 heading on each page. A good place to work in LSI keywords different from the main keyword in the title tag. The place where important, topical related content appears on the page. Why does key content location matter? Search engines read content from top to bottom. Topically related content should be mentioned near the top of the page to give the page the most relevancy for the desired topic. Your main keyword should be in the h1 tag and LSI variations of keyword should be placed in h2, h3 (when appropriate) without overtly keyword stuffing. How can I check the key content location? Use the “find” feature on a webpage to view the location of keywords on the page. The quality of the content being published (length, authoritative, informative). Determine if the content is compelling enough for link building efforts. Why does editorial strength matter? Content that is well written, robust and properly optimized will index quicker and rank better in search. Conversely, thin content, duplicate content or keyword stuffed content will not rank well and runs the risk of penalty and/or deindexing. How can I check the editorial strength of my content? Use Grammarly to check for grammar errors. Use a free online word counter tool to check how many words are in an article and compare that to existing content that’s performing well in the space. Use a keyword density checker like SEO Centro to make sure you’re not over optimizing any keywords. If you’ve outsourced content, run it through Copyscape or at the very least, copy and paste an entire paragraph into Google search to make sure it’s not published anywhere else on the net. Pages on a site with very little text and/or without rich media. Pages that serve little to no value to the end user. Why does having thin content pages matter? Creates a bad user experience and lower your sites quality score. They take longer to index or don’t index at all. Even if they do index, they have very little value and rank poorly. How can I check for thin content pages? Open Screaming Frog and enter the domain. Scroll over to the right to find “Word Count” and look for pages with less than 300 words (outside of trivial pages ie. contact, about). Consider no-indexing these low value pages. Where images on a page are hosted. Why is image location important? Images can be found in search on the web. If someone finds your image you want the path to direct them to your site. If you’re hosting images on a third party site and that site is terminated, you’ll lose the images on your site. How can I find the image location? To check images on a page, hover your cursor over the image. The image url will appear in the lower left hand side of your screen. To check images on multiple pages, use Screaming Frog “Images” tab. The file size of an image (measured in kilobyte). Why is it important to have images < 100 kb? Larger image sizes slow load time on a page. Slow load time leads to bad user experience having to wait for images to render. Large image files take up unnecessary space on your server. How can I check the file size of images? For individual images, right clicking on an image and viewing properties/info. To bulk check images, use Screaming Frog “Images” tab and filter by “Over 100 kb”. Use an image editing software to decrease large image files before uploading to site. When applied to images, the alt text will appear in it’s place when an image fails to render and gives a description of the image. Why is it important to use alt text? While it’s not recommended to stuff keywords into the alt text, it is place where you can add relevant keywords for SEO purposes. Search engines are unable to crawl images therefore unable to determine what the image is or deliver it in search queries without alt text. How can I check if images have alt text? To check alt text of an individual image, right click on the image and view image info. To bulk check alt text, use Screaming Frog “Images” and filter by “Missing Alt Text” to view the images without alt text. What are missing title tags? Not having an input into how search engines are seeing your page titles. Why do missing title tags matter? Page titles are a ranking factor, they tell search engines what your page is about. Does not give the user a clear indication as to what the content on the page is about. How can I check if I’m missing <title>? Using the title tab in Screaming Frog. What are duplicate title tags? When at least 2 pages on your site have the same title. Why do duplicate titles matter? You run the risk of search engines passing over them as similar or duplicate content. Each page on your site should have a clear, unique message. If pages have duplicate titles most likely they have similar content which would be better suited to merged together to create one robust and authoritative page with a unique title tag. How can I check for duplicate <title> tags? What are optimized title tags? Having less than 65 characters in the title tag. Why does character size matter? Having more than 65 characters will result in the title being truncated. This can cut off keywords or your message to searchers. How can I check for title character size? What are missing meta descriptions? When you don’t enter your own meta description, Google takes what it thinks is the most descriptive part of the content and uses it for the snippet to show users in the SERP. While filling out the meta description has become less important to tell the search engines what your page is about, it’s still a good place to put in keyword phrases and language that will elicit a click from the user. By not filling out the meta description, you miss the opportunity to frame your snippet the way that you want it to read. How can I check the for missing meta description? Why do duplicate meta description matter? It’s better to either have unique meta description or no meta description than to use duplicate meta description. Each page on your site should have a clear cut message. How can I check for duplicate meta description? SEO equity refers to the power of your website and how well it’s being distributed across pages. This section covers how to check SEO equity to ensure it’s not bleeding out. Tells search engines that a page has been moved temporarily. Why do 302 redirects matter? 302 redirects do not pass SEO equity, meaning if you redirect a page, the link value does not pass through. It may prevent content on the new url from indexing because Google believes at some point you will revert back to the redirected url. How can I check for 302 redirects? A string of multiple redirects from one location to another. Why do redirect chains matter? You lose “link juice” with each redirect. How can I check for redirect chains? A link that takes you to an error page. Why do broken redirects matter? How can I check for broken redirects? A command telling Googlebot not to pass any equity, trust or credit through a link. Google Search Console (formerly Google Webmaster Tools) is a critical part of an SEO campaign – it should serve as a core part of your technical analysis. These are the step by step checks to run in your account. A data providing tool by Google to monitor and maintain your site’s performance. Why does GA linked to SC matter? How can I link Google Analytics to Search Console? Sign up for a free account and select one of the methods available to connect your site to Search Console. Links that point to other pages within your website. Internal links pass link equity across your website. Establishes a hierarchy within a category (read more on “silos”). Improves user experience by making it easier to navigate. A spam penalty that has been issued to a website by a manual Google review instead of algorithmic penalty. Manual actions penalties can negatively affect your site’s rankings. You have to request Google to remove the penalty once you’ve addressed the issues by submitting a reconsideration request. They can be sitewide or partial – penalties have a major impact on your ability to rank higher in search engines. How can I check for manual action? What are Page Not Found errors? When a page on your website has been removed or moved and the url in question could not be found on your server. A 404 :”page not found error” is shown to the user. Why are page not found error important? You want to be aware of page not found errors so you can address them properly so users are not landing on error pages. How can I check for Page not found? What are Pages Blocked by robots.txt? These are pages on your website that the Googlebot is not crawling due to directives in the robots.txt file. At times, you can accidently block the wrong pages from being indexed by search engines. Simply removing this directive can mean an instant boost in traffic. How can I check for pages blocked by Robots.txt? The number of pages on your website that are in Google’s Index, aka eligible to rank in search results. If your pages are not indexed, they will not be found in search. Pages not getting indexed is a sign that your site has a penalty or low authority with search engines. How can I check for Pages Indexed? 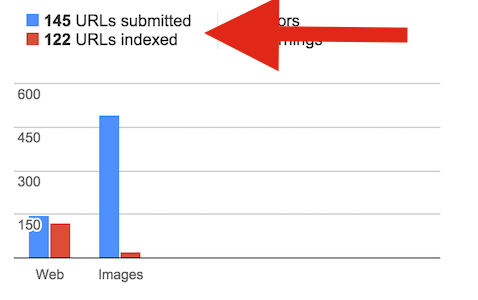 Pages indexed report in GSC. Links to pages on your site shown below the meta description in the SERP. Sitelinks have been shown to improve CTR. They present your site as a more authoritative resource. Takes up more real estate in the SERPs. It also allows the user to navigate straight to the pages on your site that are relevant to their search query. How can I check for sitelinks? Sitelinks are created algorithmically which means there’s nothing you can do to create them. The amount of pages on your site that have been indexed. Why do Sitemap Indexation matter? It will tell you if any URLs are not accessible or are blocked by robots.txt. How can I check my Sitemap Indexation? Links are an integral part of SEO – this section covers how to uncover potential issues with your website’s internal links. A link embedded in text (hyperlink), typically relevant to the content it’s linking to, that can be clicked on. Why do Anchor text Links matter? Anchor text helps Google understand the relevancy and topical nature of the page that it’s linking to. Read more about anchor text. How can I check the anchor text on my site? Screaming Frog Tool using the outbound links tab. A standard http response code that indicates the server on which the site is hosted could not find the page requested. Why do broken links matter? Broken links are natural part of the web however, having too many broken links will give users a bad experience and loss traffic. There are better ways to redirect traffic from 404 to relevant, live material. How can I check for broken links? What is a logo link? Why do logo link matter? For branding and making your logo synonymous with your homepage. Easy navigate to your homepage by clicking on your site wide logo. How can I check for a logo link? Place your cursor over you logo and it will turn into the pointer icon indicating that it’s a live link. Links that take the user offsite. Why do external links matter? Increases the topical relevance of your content. Helps readers find additional resources not included in your site. How can I check for external links? Screaming from tool external tab. What is proper use of nofollow? Typically you want to nofollow outbound links. Why does use of nofollow links matter? Follow links pass credit, trust and link equity which means you’re telling Google you’re vouching for it. Having too many follow external link will bleed the juice on your website. How can I check for nofollow links? Screaming Frog tool outlinks tab. Links coming into your site from irrelevant spam sites. Why do malicious backlinks matter? They can have a direct impact on your seo and cause spam penalties. They can shape the topical relevance of your site. How can I check for malicious backlinks? Social media is undeniably overlapping with SEO. This section covers the technical checks to make sure you’re setup properly. Formerly Google+ Pages, it’s your online business center for everything Google. Getting setup and verified as a Google Business is a massive part of SEO for local businesses. Without it, you can’t rank in local search results. For larger businesses, it’s also a verified review platform and allows you to get setup in Google Maps. How can I check if I have a G+? Typing in the name, phone and google plus in the Google search bar. What is Open Graph Snippet? A meta tag that is used to populate Facebook status box when someone shares your link. Why does Open Graph Snippet matter? 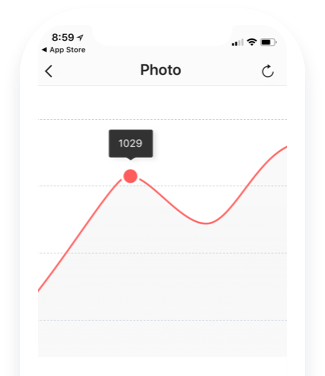 It allows you to control the image, description and title that Facebook pulls through to the status display when you automate a post or someone shares the link to your page. How can I check if my Open Graph Snippet? Typing in the meta tags manually. What are Twitter Card Snippets? Code that you embed into your site that allows an image, title and description of the post to pull through on your tweets. Why do Twitter Card Snippets matter? They give Twitter users better understanding on the content shared via the link because it shows an image, title and description of the post. Help CTR because people see more information. How can I check for Twitter Cards? Many many thanks for provide SEO Audit report . Please give me knowledge in how can Audit report ? Like that audit tool’s website. Thank you so much with God Bless you…. Wow, this is incredibly useful and must have taken a ton of time to create. It’s very thorough and clear to follow, thanks! Excellent. .Explained so beautifully ..Thanks! Good stuff – Learned some cool tips on SEO! As you will soon find me saying quite often on your blog posts…. The breakdown of all the technical details just reinforces that Im on the right track but you just expand on what im doing ten fold, so Yoink! ill just be adding these extra skills thank you very much. Thank you so much Ryan!!! This is the first time I am on your website and I suppose I landed on one of the best articles on Internet. Instantly I subscribed to your Youtube channel as well. Thanks once again 🙂 Cheers and stay awesome! youre welcome and thanks for subscribing! Thank you so much for this comprehensive guide, and the awesome template; really helpful. I’ve got a tiny little question: what do you mean by “Not addressed” status of the Legacy Condition? I am not a native speaker, and the meaning is a little unclear to me. Does it mean something like “not applicable” or something? I understand, so Legacy Condition – Not Adressed means that certain issues do not apply in some cases, like Video XML Sitemaps for a text & images website, such as a blog or a basic ecommerce site. Is that correct? It was very informative.. Thank u so much. I enjoyed from your article, Very good and very usefull infirmation. It was not only informative but also it can help people who working this field. God Bless you. As usual, very good information Ryan! 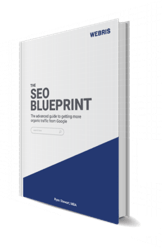 Everything I have seen on this blog is spectacular, and you have the whole entire SEO checklist here! Like how you formatted it, but I have a question concerning checklist quality. Some SEO audit companies advertise their audits as “specialized and unique towards your company”, and that it takes 30-45 days to do it. I guess this is the justification for price and time. But am I wrong? Do these SEO audit companies have in-depth engineering analytics that I don’t know about? Because from the looks of this post, it looks doable and at most mildly confusing. no – they dont. SEO audits are tough in that they take a lot of time, but more importantly they take a lot of time of someone with a lot of knowledge. in order to run this audit, you have to have context into using tools, understanding the inner workings of a website and then be able to make the right recommendations to fix them. when you do this on a huge site, it gets expnsive and time consuming. Wonderful content for technical Seo. I am reading and increase my knowledge Account. Thank you. Great work! Used this for my SEO Technical Assessment and inspiration for developing further standards for launching new sites or setting up other sites for SEO success. Used along with data, optimization for conversions and testing this provides real value for my work. Thanks agian! Amazing information Ryan! Do you have a video for this? 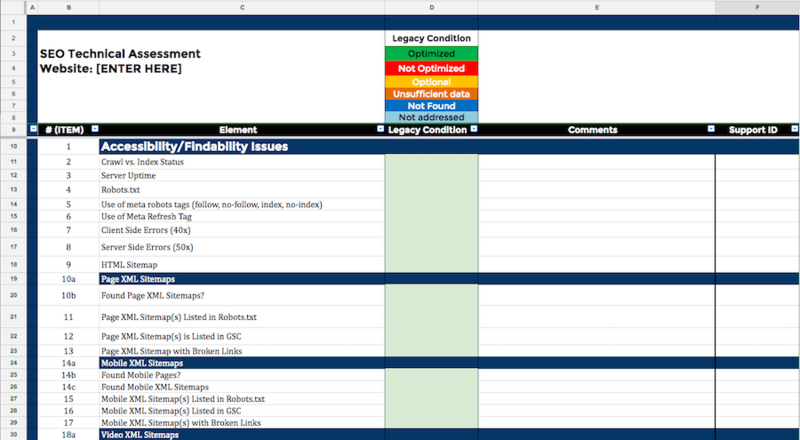 I was wondering if you type all these details manually in the sheet or if you integrate data from various tools like you showed in your content audit video. Amazing information Ryan! Everyday will be a learning day and today I learn very important information related to SEO. It will defiantly help me to improve my knowledage and working in the field of SEO. Just Amazing information at a glance.After a long time, I find out this SEO resources that will help me to achieve my goal. Many many thanks for creating this awesome advanced level technical SEO Guide. Hey Ryan, seriously awesome stuff. I have a huge audit to do and trying to get the google sheets link sent over and it’s not working. I tried to email addresses. Can you help me get the link to the sheets template? After all, a great article. I like never ever leave reviews but this guide is actually amazing so I couldn’t resist! I absolutely thank you for the bottom of my heart for providing such a superb “SEO Audit Report” outline. It is very thorough and clear and easy to read and follow. This is absolutely the best SEO Audit Report I have every seen. Thank you for putting many hours in researching & typing. Ryan, This is incred!ble.. I have 3 years of experience in SEO and Digital Marketing, I have never seen such a useful Site Audit information before. Hats off! Fantastic Stuff. You have provided information in a very well manner. I know for this you should have done enough research and you have years of knowledge with that you have provided in very short and in a clean and clear way. We have got a readymade thing. Thanks a tone, this blog helped me understanding SEO a lot. And one more thing there is a lot of spelling and grammar mistake in your blog if you like me to help you, you are most welcome. At the beginning of post you have shown a Google doc, would you be able to share that template link ? Really great step by step guide, thanks! Great content Ryan! Usefull check list. There is a spelling mistake in the word content in the “Site Depth Check” (3rd Bullet Point). 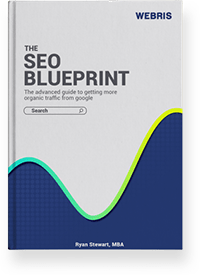 Thank You for this wonderful guide to help understand SEO the best. It literally helping a lot to perform better with my existing projects and in my seo training program. I must appreciate this piece of content. Great! Too much information about technical audit. Please keep sharing more such awesome content.